Optimized performance for Blockchain Compute Workloads. This driver is provided as a beta level support driver which should be considered “as is” and will not be supported with further updates, upgrades or bug fixes. This driver is not intended for graphics or gaming workloads. AMD is offering versions of this driver for the x64 versions of Windows 10 and Windows 7 SP1. It’s the first driver release to support all of AMD’s GCN-based GPUs including those from the new Vega architecture. Of course we had to test it so we installed it on our mining/testing rig. This rig is based on Intel’s i9-7900X and has three GPUs: an RX Vega 64, an RX Vega 56, and an R9 Fury X. The install process took a bit longer than normal and the screen blacked out repeatedly for periods of up to 30 seconds. But otherwise was the same as normal Radeon Software install process. We were rather worried for a moment when we started hearing popping noises. Lucky it was just the sausages we’d left broiling in the oven rather than our RX Vega’s exploding. Weirdly this driver still offers to install ReLive at the end. ReLive is not something that I expect would ever be installed on a mining rig. Based on the testing that Nathan Kirsch over at Legit Reviews did the performance drop that AMD’s GPUs were set to experience at higher DAGs is gone with this Blockchain Compute driver and performance for Vega and Polaris-based GPUs has improved slightly at the current DAG level. For those that are unfamiliar with the DAG problem it’s essentially a parameter of the Ethereum blockchain that specifies how difficult it is to mine new blocks. As more blocks are mined the DAG level increases. High DAG levels also require more memory than the lower DAG levels. Increased DAG levels don’t have a big impact on the performance of NVIDIA’s products. But for AMD’s GPUs, especially those with 4GBs of VRAM or less, mining performance was reduced significantly. Now the current DAG level isn’t high enough to trigger these issues, but it would have been a problem eventually. With AMD’s new Blockchain Compute driver the specter of DAG increases is no longer hanging over the company’s head. Conceptually I’m really happy that AMD finally decided to release a driver specifically for mining. As the GPU mining segment has developed over the past seven years miners and the developers of the mining clients they use have noticed that specific revision of AMD’s drivers offered better mining performance that others. Some mining clients were optimized specifically for good performance with a well-known version of AMD’s driver rather than for whatever happened to be the latest driver from AMD. Now that AMD is releasing standalone drivers that it’s optimizing specifically for mining performance AMD is giving the developers of these crypto-mining clients a new manufacturer sanctioned development target. This makes the development process less error prone and opens the door to more aggressive driver-specific performance tuning. 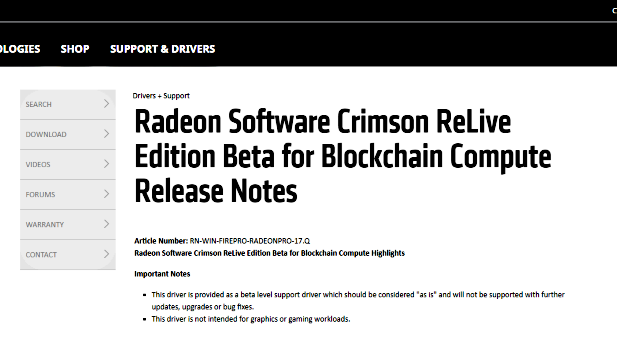 With this driver release AMD is validating the single biggest, and perhaps most volatile, market for GPU compute: mining. They are making it official that they care about miners and are now willingly making the investments required to be a player in the future of crypto-mining.